Why dance when you can Fly? Connect with the Dragons, and fly with them into a multi-dimensional junction of time and space where magick can, and should take place! 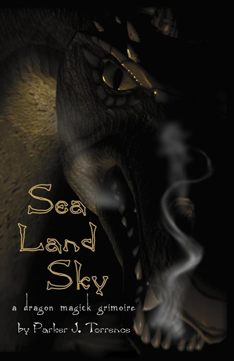 Sea Land Sky by Parker J. Torrence will take your magick to these new heights. Designed and written to invoke new ideas for those who feel that there is little left to learn within their chosen path. It is presupposed that you have a working knowledge of the elements common to most Western Magickal systems, and that you have mastered the basics of creating your own Sacred Space. An introduction to the world of Dragon Magick, and the Realms of Sea, Land, and Sky. Here There Be Dragons, and here you will learn the mystical art of meeting them, and how to incorporate them into your magickal rituals. A miscellany of rituals, spells, and formulas. Everything needed to practice the art of Dragon Magick. Designed to be used by the solitaire witch, or by a group. In my opinion the ultimate book on dragon magick. I need to order another copy soon, because mine is falling apart from all the use.